Once you get energy consumption under control, you can turn your attention to alternative energy sources. Wind, solar and water are all feasible energy sources for a cruising boat. Each source has its own pros and cons. Solar power, even in northern cruising grounds, can be a massive energy source. The panels take up space but as long as it’s sunny the panels will silently generate power. Wire is an important component of a good electrical system. Use a wire table to determine what size wire to use based on current loads and distance, remembering to double the distance from source to the load. Wind generators take up a little room and can be noisy but can generate power in windy anchorages. However, the advantages of wind generators diminish when the boat is underway and the apparent wind decreases. Modern water generators mount on the transom like an outboard. The units are unobtrusive but add enough drag to slow the boat down by about a knot, which can quickly add up on a long passage. But if you can cope with that disadvantage, water generators as well as solar or wind generators can produce the majority of the required power. 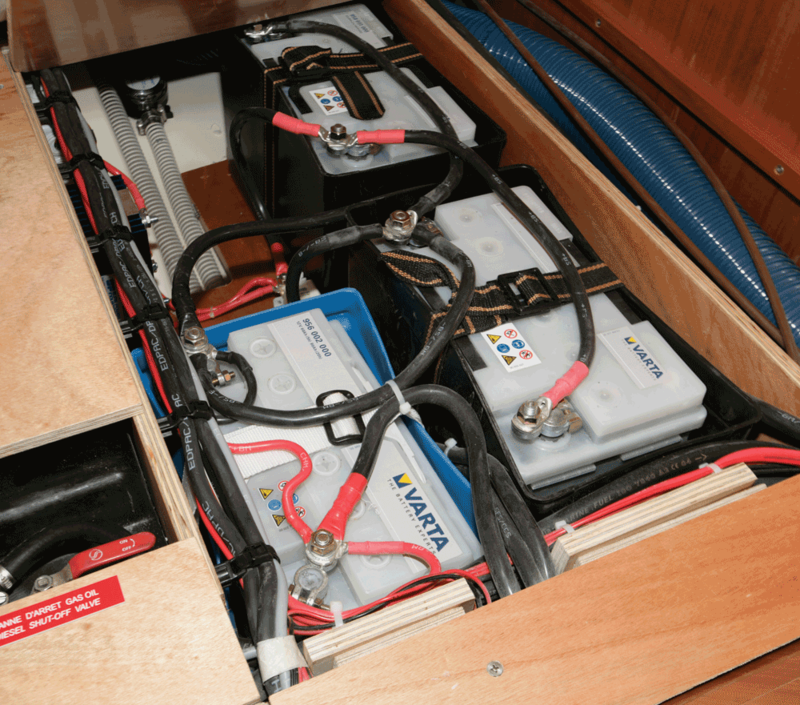 In the past, boats had two battery banks connected with a 1-2-BOTH switch. The idea was to always keep a bank in isolation as a spare. But in reality, the switches were often not understood and even if they were, people forgot to manage them. A better configuration is three individual switches, one for the house bank, another for the engine start and a parallel switch to combine the banks if needed. With switches like these, under normal conditions you keep the engine and house switches closed and the leave the parallel switch open. With the two banks isolated, you will still need a way to charge them from single-output charging sources like your alternator, alternative sources or a shoreside charger. Traditionally this was done with a battery combiner (sometimes called an isolator). A combiner is a diode-based device that acts as a check valve: Power is fed in one side and then output to two or more battery banks. Combiners worked well but the dirty little secret is that they drop almost .75 volts. That may not seem like a lot, but there is only about a volt of difference between a charged and discharged battery, and it is shame to waste that power when it could be used to charge the batteries. A better solution is an automatic charge relay, which functions as a voltage-controlled parallel switch. If the switch sees a charging voltage (14 volts or so) on either bank, it will close and parallel the banks so they both can charge from the same source. When the voltage drops below 13 volts the switch opens back up. Swapping out light fixtures with LEDs can save a great deal of energy. 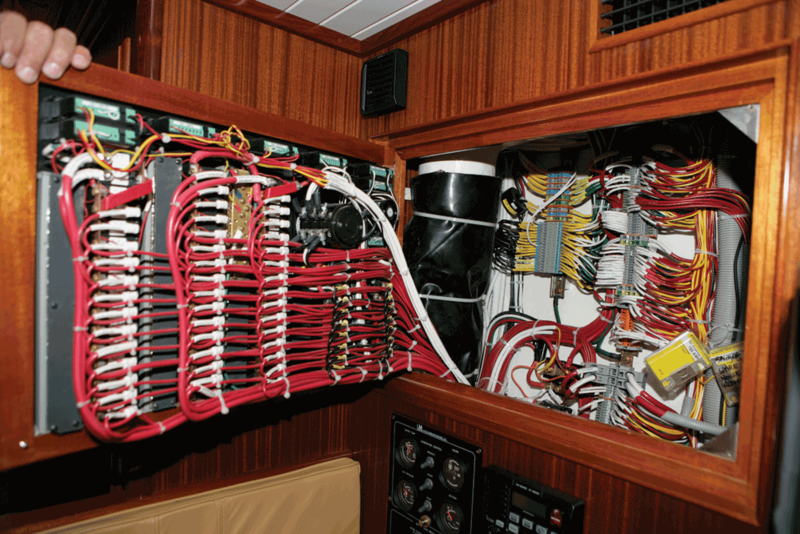 An unappreciated aspect of a good electrical system is adequate current capacity in the wiring. 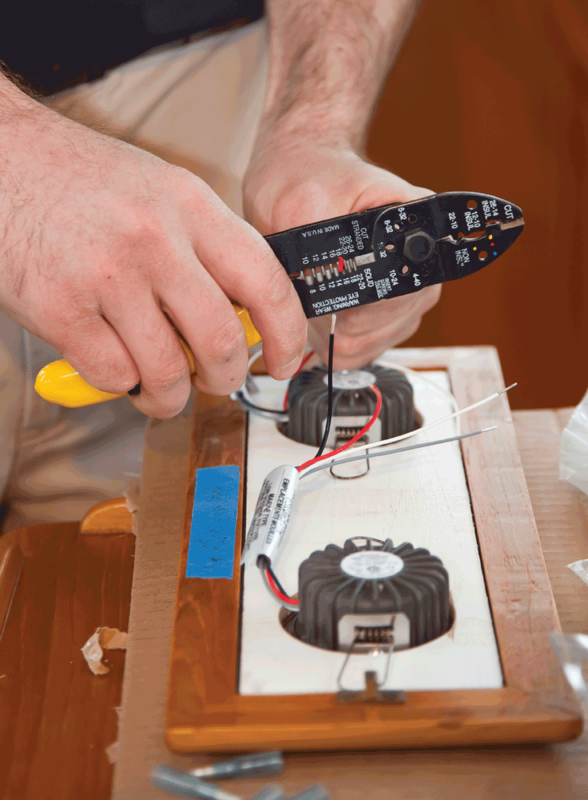 Undersized wiring results in an unnecessary voltage drop and, if drastically undersized, a fire hazard. Wire is underspecified for a variety of reasons, including cost and confusion about wire sizing tables. Wire tables typically take the current load and wire distance as input and yield the wire size required. The current load is easy enough to get just by reading it off the device you are powering, but distance is trickier. It is not widely understood that the distance under consideration is the round-trip distance from the source (breaker or battery) to the load and back to the source. For example if you are adding a light in your cockpit, you need to measure the distance the wire travels to get to the cockpit and then double it. In higher current applications, like things connected to a battery or engine, the quality and material of the connectors can make a big difference. I once debugged a voltage-drop system in a fuse holder, and it turned out the holder was dropping almost a volt. The fuse holder had threaded stainless steel studs on the connector with a plated-copper connection pad at its base. It was supplied with stainless nuts, washers and lock washers to hold everything together. The idea was to put the wire terminal on the stud and hold it in place with a washer, lock washer and nut. In this configuration the terminal was directly on the plated copper pad. Unfortunately, this connection was made with the washer first, then the terminal, and finally secured with the lock washer and nut. The stainless washer between the terminal and the fuse holder induced enough resistance to drop significant voltage. A simple restack of the fasteners fixed the problem and was a practical example of the conduction differences between copper and stainless steel. Battery compartments are often located under settees. A properly designed system still needs to be monitored to be sure it is operating correctly. An old-school voltmeter and ammeter are a start but don’t provide the whole picture. These devices will give the instantaneous reading but don’t integrate those readings over time. A true battery monitor, which costs less than $250, will let you know how much current flows in each direction (charging and running your loads) giving you a good idea of the state of your batteries at any given time. If you understand your electrical budget and build a system to support it, you can sit back and not worry about your electrical system. We are living in the age of efficient electrical consumption and alternative energy, there is no better place to enjoy the fruits of these technologies than aboard a sailboat.